Select the file to be downloaded, depending on the operating system. This wiki shows the update routine for a Windows PC. Right select on the downloaded file and "Run as Administrator" and the following screen will probably appear (can be different based on the version of the Windows operating system). A new screen "User Account Control" appears and click "yes". 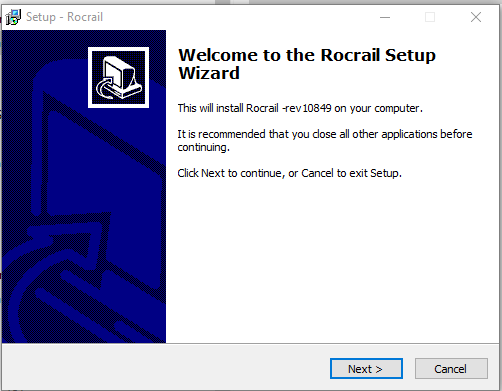 "Welcome to Rocrail Setup Wizard" (See screen below) and follow the instructions. When changing the operating system from Win32 to Win64, then also change the shortcuts, as the target directory has changed. 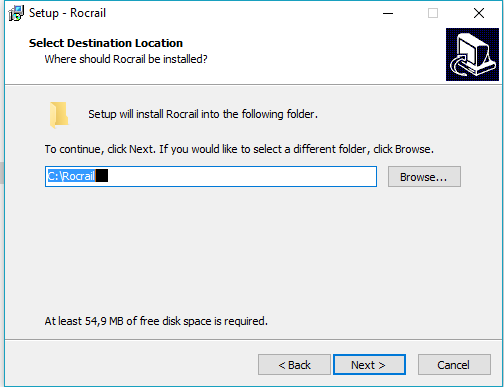 "Select the installation directory (But it is easier to keep the default)" (Here C:\Rocrail\) and follow the instructions. If needed, verify if the new version was installed successfully. Start Rocview and then select "Help → Info", the version shown there should match the version (xxxxx) that was selected. 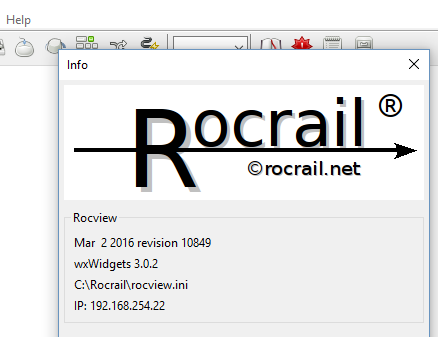 Want to load the plan every time when starting Rocrail, then set the parameters in Rocview Properties → Path. The subdirectory (Workspace) of the plan, here \Final Plan. The plan.xml file is located in "Final Plan". Set the checkmark so the plan loads automatically. Right mouse click on the Rocview.exe file and select create Shortcut. Move this shortcut (for example) to the desktop or the taskbar. Don't forget to update the shortcut if after changing from Win32 to Win64.